Over medium heat, melt the butter in a saucepan. Add the spices and let saute a few moments until you can smell the garlic. Add the cream. Stir frequently until it has just about reached a boil. Turn off the burner and add the parmesan. Stir until the sauce is smooth (this will take a few minutes and a lot of lump smooshing, especially if you use powdered parmesan). Serve over chicken, fish, spaghetti squash, or other vegetables. Or eat it by itself like a soup. Recipe is easily doubled or even quadrupled. 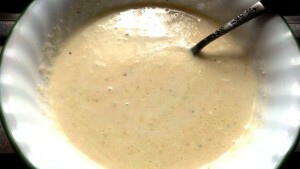 When stored in the refrigerator, the sauce will become very thick, but it melts when reheated. Will keep fine in your refrigerator for several days. This entry was posted in Low-Carb Recipes. Bookmark the permalink.